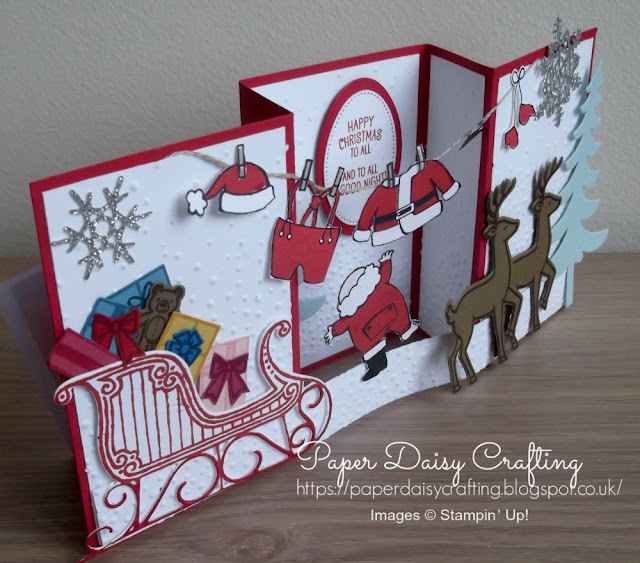 Paper Daisy Crafting: Santa's Suit from Stampin' Up! Santa's Suit from Stampin' Up! A few weeks ago I attended a team training day and participated in some "swaps" - this is where we all make a number of the same card or project and swap with other demos so that we end up with a whole load of different projects to use as inspiration in our businesses. One of the swap groups I was in was for Christmas cards and three of the cards I received used the "Santa's Suit" stamp set from the Autumn Winter catalogue. This is not one I had bought myself but I thought you might like to see the cards I received. They were all incredibly intricate and I can't imagine how much time (and talent) was taken to produce these. Here is the first card. This one was made by Saffron Redman-Morriss. Thank you so much Saffron for your beautiful card. Come back tomorrow to see another, equally stunning card.